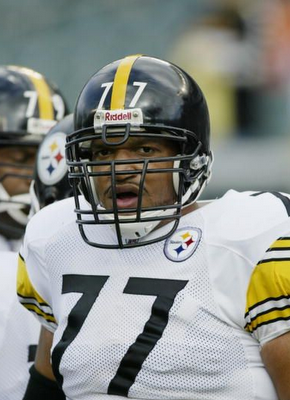 Marvel Smith, a two-time Super Bowl champion and 2004 Pro Bowl selection, has announced his retirement from the NFL. Smith, who signed with San Francisco in March after nine years with the Steelers, was slowly recovering from offseason back surgery and never posed much of a threat to Niner RT Adam Snyder during the preseason. A second-round pick of the Steelers in the 2000 draft, Smith played in 111 games, starting 108 of them, over his nine-year career. But injuries would hamper the tail end of his time in Pittsburgh, causing him to miss 11 regular season games in 2008 and four in 2007. The 49ers knew signing a nine-year veteran with a back problem was risky; general manager Scot McCloughan said at one point that Smith had a 50-50 chance to return to his Pro Bowl ways. Obviously the team's gamble didn't pay off. The signing of Smith also may have factored in the decision to take wide receiver Michael Crabtree with the 10th overall pick instead of Ole Miss tackle Michael Oher. Taking him with the 21st pick, Oher signed early, has played well and looks to have won the job at right tackle. Crabtree remains a holdout and his camp continues to make threats that he's going to stay out for the entire season. It's rare that the Cleveland Browns make what so far appears to be a good call in the personnel department, because Crabtree has pretty much lived up to their ominous pre-draft assessment. Combine the choice of Crabtree with betting on Smith to somehow flip a switch and be perfectly healthy in 2009, and there you have the 49ers in a nutshell. There's a reason why they haven't been to the playoffs since 2002.